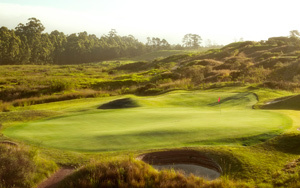 We have listed a few popular sample South African golfing itineraries below. The purpose of this page is to provide a little more information for those interested in a golf trip to South Africa, with groups of courses that make sense to include on one itinerary and the corresponding approximate starting prices. Please know that if you choose to book a trip with us, your group’s itinerary will be created from scratch so that every aspect of your trip is custom-tailored to your group’s needs. With the beauty of its gorgeous beaches and famous Table Mountain to provide a majestic backdrop, it is no wonder that Travel & Leisure ranked Cape Town as one of the 10 best cities in the world. We recommend the following itinerary that starts at Fancourt and gradually works west to Cape Town, following the Garden Route through some of the most pristine golfing landscape in South Africa. End your journey up close and personal with the big 5 at one of the Kruger area’s outstanding private game reserves. The northeast part of South Africa is home to the country’s largest and busiest city, Johannesburg, as well as the popular resort destination Sun City and one of the world’s great wildlife sanctuaries, Kruger National Park. Follow our suggested itinerary below and play five of South Africa’s best courses, visit Johannesburg’s famous Apartheid Museum, and come face to face with some of Africa’s majestic wildlife at South Africa’s premier wildlife reserve.